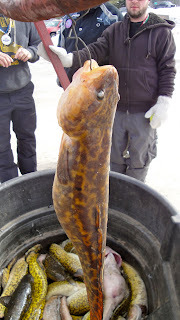 My Crazy Mind: Eelpout Festival! My Favorite Time Of Year!! Eelpout Festival! My Favorite Time Of Year!! This will be my eighth year attending and I don't ever want to miss it. 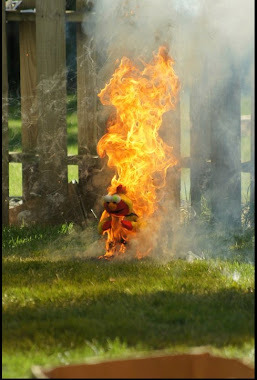 It started out on a whim. While we were at a friends cabin fishing only about a hour away, we decided to grab our gear and head over and try and catch us some Pout. Once we got there and saw what was happening, we quickly realized that our fishing gear would do us no good. One problem, my lonely case of beer was not going to be enough for the day. The first thing we witnessed was the Polar Plunge. A giant hole cut into the lake, where people throw on some crazy outfits and jump in the freezing water for a chance to raise some cash for charity. There was also, helicopter rides, a rugby game happening on the lake, a ice fishing bikini show, lots of vendors selling Winter gear, and the official Eelpout weigh center. Once we saw the mild stuff, it was time to see where everyone else was going. 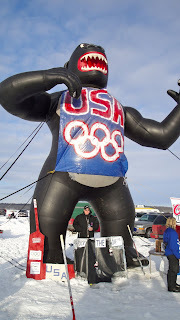 We headed onto the lake and around the point and the first thing we saw on the ice was a 30 foot tall inflatable Gorrilla. I knew it was going to be a good day. Everything is set up similar to Vegas is the best way to describe it. There is a giant road on the ice, and on each side are themed encampments. These encampments are usually around 30' x 30' big and inside they have dance floors, fully stocked bars, couches, beer pong tables, flip cup tables, hot tubs, you name. All you do is walk up and down the row and go encampment to encampment to party. 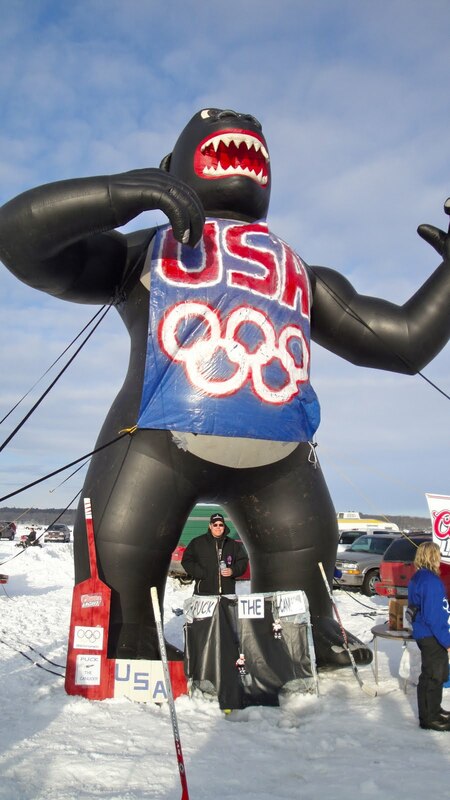 There really is no way to accurately describe Eelpout festival besides some of the most fun you could ever have on a frozen lake! Everyone we have ever brought has loved it and come back with us. I think our group was around 30 people last year! Maybe we will make our own encampment next year! Check It Out!! This is a blog I am setting up so I can jot down all the craziness that flows through my head on a daily basis. I never know whats going to pop into there, but if I find it entertaining, I will jot it down here. I hope you enjoy it. I am a fun loving, garage sale finding, contest entering, ice fishing, beer drinking, Nascar watching, MN Sports team rooter, dog loving, grilling enthusiast, movie watching, good time haver. 1st Giveaway In The Books! Taco Burgers, The Best Burger Ever!